Today all businesses battle with unprecedented competitive pressures. In order to succeed—or even survive— they must rapidly adapt to constantly changing environments, in every industry and sector. What does this mean for IT leaders? Transformation, on all fronts. The very factors driving digital transformation in businesses are also pressuring IT organizations to transform. Customer expectations have increased. Companies live and die by the applications they provide to their customers and employees. A smartphone is the modern bank branch. The palm of your hand is replacing traditional brick-and-mortar stores. Access without delay or interruption, 24/7, is the new normal. If they can’t get what they want, when they want it, customers go elsewhere. 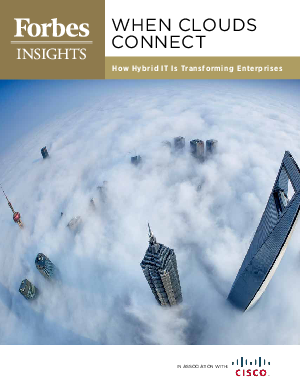 The cloud journey and infrastructure modernization are integral parts of IT transformation. Public cloud is a mature business model for many organizations, offering higher agility, lower operational costs and the ability to meet unpredictable demand. But that means the IT department must manage a whole new dimension of IT infrastructure over which it has little or no direct control, while also maintaining still-critical private cloud and data center responsibilities.